Pontoon boats from the Isles of Capri Marina are the perfect platform for shallow water fishing in the backwaters of the Marco Island and the Naples Florida area. 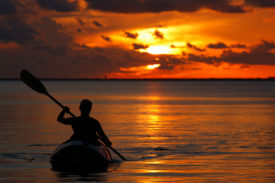 You may also enjoy nature tours through the wilderness and trips to uninhabited islands for shelling and swimming. You don't need a destination or a plan with a pontoon boat. 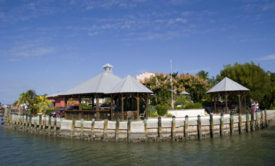 Pack a lunch or grab something from the Island Gypsy and enjoy a picnic on the water! Our pontoon boats work great for all of that and more. Our pontoon boats are 22 foot Crest Sports. All boats are 5 years and younger and are thoroughly maintained by the Isles of Capri Marina's staff. 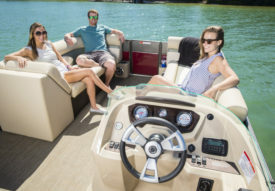 These pontoon boats are known for being reliable, stable, quick and economical, with all the features you need for a safe and enjoyable day on the water. All of our pontoon boats feature quiet and reliable 4-stroke Yamaha outboard engines. Share the fun with your friends & family! 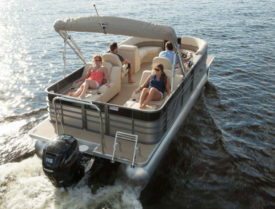 We equip our pontoon boats with all required safety equipment. Even if you have no prior boating experience, the marina staff can take the time to familiarize you and your crew with all of the features of our pontoon boats. It is our goal to ensure that you have a safe and fun experience in one of our pontoon boats. Our staff makes boat rental fun and easy! We have a friendly and knowledgeable staff to help you. Ask the marina staff for tips on where to go. Whether you're looking for good fishing or a place to spot wildlife let us help create your perfect adventure. Perhaps you are just looking a quiet place to hang out. We know the Marco River and the Marco Island area and can help you find whatever you are looking for. We help you get away from the dock and meet you when you arrive back at the dock. And we make all of it easy for you. You'll never forget your time on our rental boats. The Marco Island, Naples and North 10,000 Islands areas are the most beautiful waters in Southwest Florida. Contact us or book online today to reserve a pontoon boat for your next Marco Island area vacation!